As time passes, this soil settles and can trap water against your basement walls. First it may lead to wet basements. Then, the basement walls gradually develop long horizontal cracks, and if ignored, eventually the walls collapse. 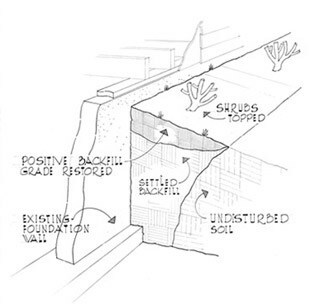 Backfill settlement is the number one cause of wet basements and caved-in basement walls. Warning: basement walls CAN collapse!